We have some great Thanksgiving dinner ideas for you. Fine dining at some of the best restaurants in San Diego, California. Enjoy a dinner out, or make a traditional Thanksgiving dinner at home for you and your family. When is Thanksgiving this year? Thanksgiving Day is Thursday November 28 2019. Note: Menus and prices may vary slightly. Hotel del Coronado Thanksgiving Dinner - Hotel del Coronado, 1500 Orange Avenue, Coronado, CA 92118. Thanksgiving Dinner served from noon until 6 PM. $125 - $140 for adults; $50 for children 6-10; free for children 5 and under. Hotel del Coronado will be featuring a classic Thanksgiving buffet with all of the trimmings. Make it a day and go ice skating in the seasonal rink, right at the beach! It opens at The Del on the day before Thanksgiving. Call now for reservations to dine in the Oceanview Ballroom or historic Crown Room. Phone number (619) 522-8490. The Marine Room The Marine Room, 2000 Spindrift Dr., La Jolla, CA 92037 from noon to 7 PM. Enjoy the stunning views of La Jolla Bay in an elegant setting. Go early or stay late and enjoy the La Jolla Coast Walk. Main courses ranges from $36-$49; appetizers $17-$21; desserts $14. Phone number (866) 644-2351. Vigilucci's Italian Restaurant - Thursday Thanksgiving day from noon - 8:00 PM. If you are looking for some great Thanksgiving dinner ideas, it's hard to go wrong with Vigilucci's restaurant. They offer a Thanksgiving dinner feast with some Italian flavor. Locations in Coronado, CA and several locations in North San Diego county, including Carlsbad and Encinitas. 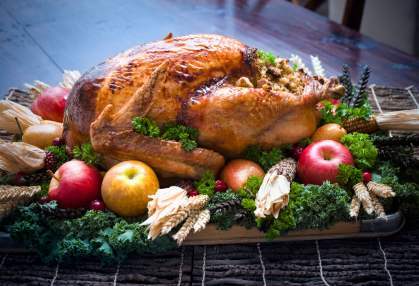 Order your Thanksgiving dinner from the set menu, or order off their special holiday menu. Il Fornaio - Thursday Thanksgiving day from 11:30 AM - 8:00 PM. Four course Thanksgiving day feast with some Italian influence. Locations in Coronado, CA and Del Mar, CA. Hornblower Cruises on San Diego Bay - Thanksgiving Day cruise at Hornblower Cruises at the Embarcadero in San Diego CA. Cruise San Diego bay for a relaxing two and a half hour cruise with family and friends. Enjoy a traditional Thanksgiving buffet with all of the trimmings including a champagne, coffee, and tea. $95 to $115; discounts for children, seniors, and military. Board at 2:30 for the 3:00 PM cruise or 3 for the 3:30 PM cruise. Call for reservations phone number (888) 467-6256. Bertrand at Mister A's Thanksgiving Fine Dining - Enjoy your Thanksgiving San Diego dinner at award-winning best San Diego restaurant Bertrand at Mister A's in San Diego, with a modern take on the holiday dinner. Oven roasted fresh turkey, almond & parmesan crusted sea bass, prime rib and lobster on the menu. Sells out early. Call for reservations 619-239-1377. Terra Restaurant Thanksgiving Dinner - If you are looking for some fine dining Thanksgiving dinner ideas in a casual SD atmosphere, try Terra Restaurant in San Diego. Three-course Thanksgiving feast featuring ingredients from San Diego's farm bounty. Dine in or take out options available. Multiple seating times. Call for reservations. Phone number (619) 293-7088. The Prado at Balboa Park - Thursday Thanksgiving day from 1- 7 pm. For a uniquely San Diego Thanksgiving dinner ideas, try Thanksgiving dinner at Balboa Park, where you can both dine at The Prado and explore San Diego Balboa Park . 1549 El Prado, Balboa Park, San Diego, from 3:00 - 8:00 PM. Call for reservations. Telephone: (619) 557-9441. Hilton Torrey Pines - Thanksgiving Dinner from 5 - 9:30 pm at Hilton La Jolla Torrey Pines, 10950 N. Torrey Pines Road in La Jolla San Diego Cal. Enjoy an elaborate Thanksgiving feast buffet at the Torreyana Grille. From the terrace you can see spectacular views of the Pacific Ocean. Go early or stay late and explore the Torrey Pines State Reserve just to the north or Torrey Pines Glider Port just to the south. Reservations Call phone number 858 450-4571. $60 adults and $30 children 5 to 12 years old. Fun Things to do on Thanksgiving Weekend - If you are looking for some fun things to do, see our web page on San Diego Thanksgiving Activities. I love a traditional Thanksgiving dinner at home. If you have a large group of family or friends, ask each person to bring a favorite family recipe.